NOTE: Once your order is placed and approved, you will receive 2 e-mails. The first will be the order confirmation. 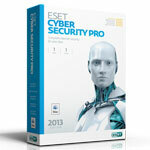 The Second comes from ESET with a link to download the product, a case-sensitive username and a case-sensitive password. KEEP THIS EMAIL.